Flags of the American Centennial era feature some of the most spectacular and striking designs of any period. On today's flag, we have standardized on straight rows of stars, carefully placed based on specific regulations. Original designs on flags like this beautiful 38 star double oval medallion will likely never be made again. Several of the medallion pattern flags in the Rare Flags collection have variations in their cantons that makes them a unique example of the type, and this flag is one of them. I'm not aware of any another precisely like it. It has a large, bold center star, surrounded by an oval wreath of twelve smaller stars. These center thirteen, certainly symbolic of the original thirteen colonies, is then surrounded by a larger oval wreath of seventeen stars, and in each corner of the canton, we find not just one corner star as typically seen on medallion pattern flags, but two stars, radiating out from the center. The flag is made of richly colored wool bunting, and has survived in a remarkable state of preservation all these years. The stars are hand sewn and made of cotton. The stripes and hoist are treadle-sewn. The canton consists of four pieces of wool bunting. The cotton hoist has thirteen grommets, which are made of metal ringlets that are then sewn whip-stitch style to the hoist. That particular technique is not often seen, and the red thread used to sew the grommets adds an interesting visual touch to the hoist. Another great historical attribute of this flag is that it descended in a single family, who cared for it over several generations. It was preserved by the Horn/Nienaber family from the region of Woodstock, Ohio, and likely has resided in Ohio since the time of the Centennial in 1876. 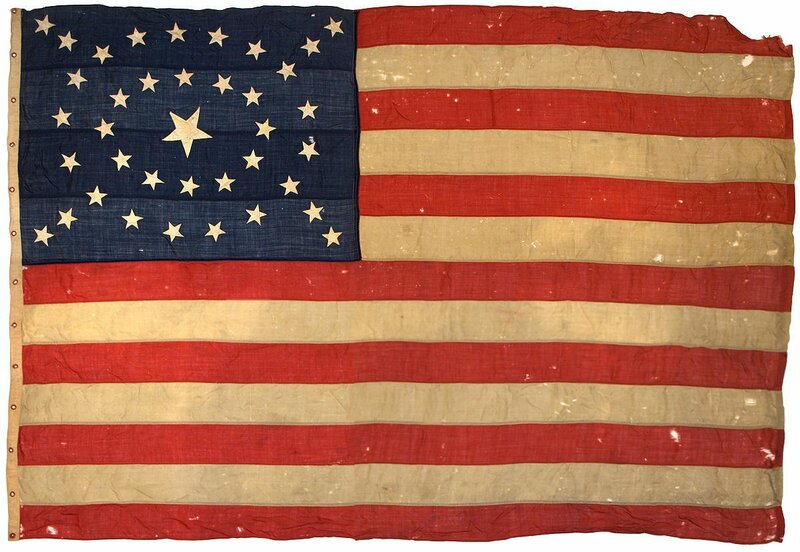 It is a rare and beautiful example of flag making and design in the Centennial era, one the most exuberant times in 19th century America. Learn more about flags with large center stars.